Who hasn’t felt relaxed as soon as they’ve sat down next to a stream? We are naturally drawn to water – to hear it, to see it and to feel it. There is something refreshing about the calming murmuring of a running stream that gives our busy lives some precious moments of tranquility as we take in the mesmerising shadows and highlights on moving water. At Ben Harris Gardens, we know that one size does not fit all. The right solution for you depends as much on the layout and available space of your site as it does on how much ongoing involvement you want with your new water feature. 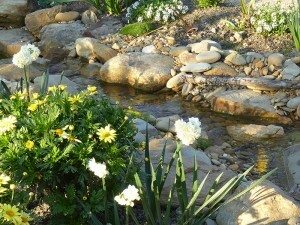 Well-designed natural water features – ponds, billabongs, waterfalls and streams – look amazing. The key is to make them look as natural as possible. Streams and waterfalls need to appear as though they have been carved out of the ground, preferably on an existing slope. The rocks should vary in size, and never look too symmetrical. The same applies to the flow of the water – it looks better when the water meanders between rocks and around corners, rather than in a straight line. 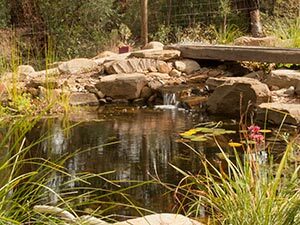 We construct ponds using the toughest and highest-quality rubber liner. We hide the liner with carefully-placed boulders, rocks and pebbles, and complete the picture with a variety of well-chosen aquatic and marginal plants. Our ponds are filtered biologically, with a combination of beneficial bacteria and planting to ensure the water remains clear. For mechanical filtration we install a skimmer box that houses the pump and removes leaves and debris from the pond surface. Find out more about our natural ponds.